Describe your most recent book. In the spring of 2016, I stumbled entirely by accident on a massive family secret. My father — whom I adored, and who died when I was young — hadn’t been my biological father. I made this discovery because I had my DNA tested through a commercial testing site. There was no reason for me to do this. I was certain of my family history. I was raised in an observant Jewish home, and both sets of my ancestors were from Eastern Europe. Except… that turned out not to be the case. The true story of my identity quickly became clear — shockingly so, after 54 years of it having been hidden from me. And that story involves the history of reproductive medicine, which is a fascinating and disturbing world, and ultimately, the search for my biological father, who had been a sperm donor. After a lifetime as a writer, having written nine books — both novels and other memoirs — that thematically dealt with family secrets, I was stunned to realize what I had always been writing without ever understanding why. The secret was me. I began writing Inheritance very quickly after making my discovery, in detective mode, racing the clock, trying to understand as much as I could about how I came to exist — while some of the people who might have information or clues were still alive. Are You There God, It’s Me, Margaret by Judy Blume. I’m far from alone in this. I always wrote, but I didn’t know it was possible to be a writer. I didn’t make the connection between the books I loved and the idea that someone, somewhere, spent her life writing them until I was in college. I went to Sarah Lawrence, where many working writers also taught creative writing. Grace Paley, the great American short story writer, was a mentor. I’m not even sure I was aware of watching her carefully — not only studying with her, but studying her — but I think I always was. Grace, and E. M. Broner, and Bharati Mukherjee — to whom I once gave a ride back into the city after a reading — these were women writers who helped me, by their example, see that it was possible. I live with my family in a rural part of Connecticut. My husband is also a writer, and we both work at home. My office is upstairs, a small space, which I prefer. I’m surrounded by books — on shelves, in piles, and I have a desk that I don’t write on, and a chaise, where I do. I also tend to leave home when I’m stuck, take a drive, and work in a local café. Oh, I’ve had so many! When my memoir Devotion was published, many readers shared their spiritual experiences with me, which was entirely unexpected and very meaningful. When my memoir Hourglass came out, many readers wrote to me with stories of their own marriages, since Hourglass is about marriage. Writing happens in isolation, and when a book enters the world it pierces that isolation and reminds me that we are all more alike than we’re different. A good thing to remember, especially these days. I don’t like taking physical risks. I’ll take literary risks — psychological, emotional, creative risks — with ease. But don’t ask me to climb a mountain or jump out of a plane. Both my son and my husband are adventurous, and I am too — but not in that way. Janet Hobhouse was a wonderful novelist who died far too young, of ovarian cancer at the age of 43. Her greatest work is her final novel, The Furies, which is a magnificent story — quite autobiographical — of three generations of women in a family set in New York and London. There’s a tremendous urgency to her storytelling and her prose is beautiful. Have you ever made a literary pilgrimage? No, but I want to! I’d like to visit Monk’s House in East Sussex, where Virginia Woolf lived and wrote. Up until this point in my life as a writer, I believe I’ve gotten better with each book. My only competition has been with myself, and I feel great satisfaction in having bested myself each time. If that were to stop — that would scare me. Because why else do this work? If not to take big leaps, creative risks? Offer a favorite sentence or passage from another writer. “I saw my ex-husband in the street. I was sitting on the steps of the new library. This, from Grace Paley’s short story “Wants” from Enormous Changes at the Last Minute. What's your biggest grammatical pet peeve? These days, my pet peeves mostly involve email etiquette. It seems a period at the end of a sentence no longer suffices, and even one exclamation point seems rather tepid. We’re using more and more ALL CAPS and rows of exclamation points to convey any kind of excitement at all. Not to mention emojis. Where do we go from here? Bees. I was told I was allergic as a child. I’m not, apparently. But old phobias die hard. My husband is a screenwriter and director, so he gets me hooked on TV shows pretty regularly. I mean, these are often amazing dramas, but I tend to feel slightly guilty when we stay up late, binge-watching. My Top Five Books That Helped Me Navigate These Rough and Powerful Waters. 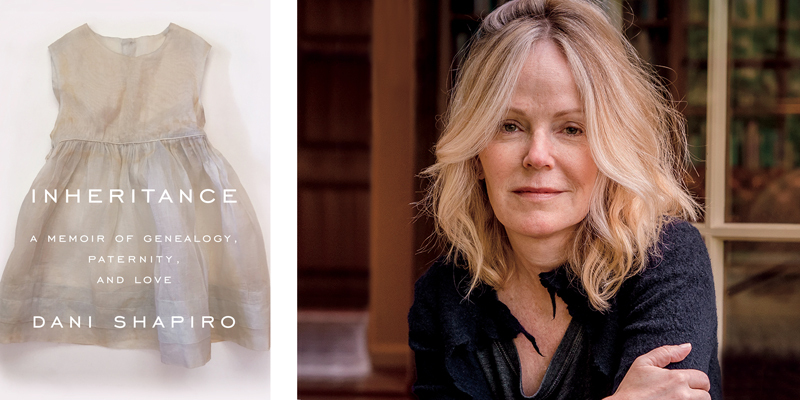 Dani Shapiro is the author of the memoirs Hourglass, Still Writing, Devotion, and Slow Motion and five novels including Black and White and Family History. Also an essayist and a journalist, Shapiro’s short fiction, essays, and journalistic pieces have appeared in The New Yorker, Granta, Tin House, One Story, Elle, Vogue, O, The Oprah Magazine, The New York Times Book Review, the op-ed pages of The New York Times, and many other publications. She has taught in the writing programs at Columbia, NYU, the New School, and Wesleyan University; she is cofounder of the Sirenland Writers Conference in Positano, Italy. She lives with her family in Litchfield County, Connecticut. Inheritance is her most recent book. One Response to "Powell's Q&A: Dani Shapiro, Author of 'Inheritance'"
This is the beginning of a conversation that has been coming since we figured out how to test our genes. There will be tens of thousand more who find out truths that are hard to digest. I loved this book and Ms. Shapiro's search for identity. It doesn't really matter who our people are. We are all humans and all have our own search for who we are and where we fit.